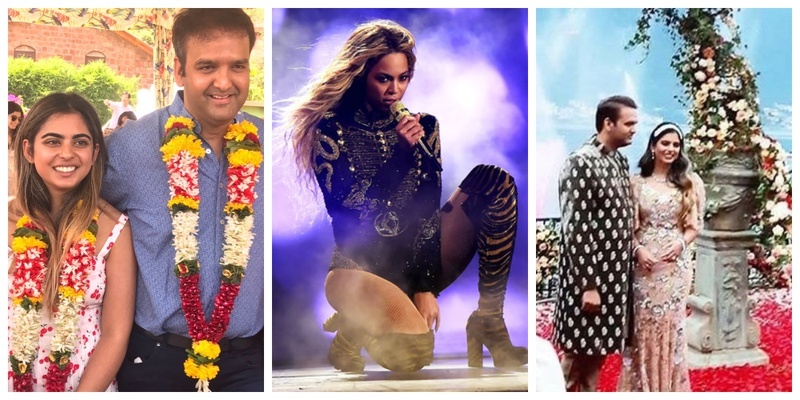 Beyonce to Perform at Isha Ambani and Anand Piramal's Sangeet Ceremony at Udaipur! Buckle up people, because it’s going to be raining celebrity weddings in the upcoming months! From Ranveer Singh and Deepika Padukone, Priyanka Chopra and Nick Jonas, Isha Ambani and Anand Piramal, Kapil Sharma and Ginni Chatrath, everyone seems to be planning a grand wedding in either in November or December. While all of these weddings will be grand, the grander-than-life one will of course be that of Isha Ambani and Anand Parimal. Well, it’s a no brainer considering the lavish 3-day engagement at Lake Como! I am still recovering from those larger-than-life firecrackers, the sparkling lights in the sky reaching out to the hologram of Isha and Anand on a building, and the engagement being designed by Dolce & Gabbana! What stunned everyone, and by that I mean EVERYONE, was the live performance by John freakin' Legend on 'All of Me'! Supposedly Isha is a big fan of Beyonce (well, who isn't) and her daddy dearest went ahead and made this happen! If you are wondering how much does it cost, it’s a whopping INR 15 crore! Yaaasss that’s how much Queen Bey charges for private shows - $2 million ! So while I groove to ‘Single Ladies’ with my BFF’s on a lame Tuesday afternoon, here’s wondering what the Isha Ambani and Anand Piramal Royal Wedding will look like from 8th to 10th December in Udaipur. Will they start the garba formation while Beyonce sings - Naughty Love. Will the mamajis do a naagin dance on Crazy in Love? Dear Ambani wedding attendees, please up your Instagram Game!